Tabasco is a brand of hot sauce, and it's also among the most well-known blends. The sauce is made from Tabasco peppers, vinegar and salt, and the resulting flavor -- bold and intense -- pairs well with a wide variety of foods and recipes. Though it doesn't supply much in the way of vitamins and minerals, it offers other health benefits. A teaspoon of original Tabasco sauce contains zero calories and zero grams of fat. The sauce doesn't supply essential nutrients, such as protein, fiber, vitamin C, calcium or iron, but its lack of calories or fat means it can have a valuable place in your healthy eating plan. The green jalapeno flavor supplies 6 percent of your daily vitamin C needs. The sweet and spicy flavor contains 15 calories per teaspoon, but the other flavors, including buffalo, habanero and chipotle pepper, are calorie- and fat-free. Tabasco sauce contains capsaicin, a pain reliever, according to the University of Maryland Medical Center. Capsaicin also aids in digestion and reduces the symptoms of indigestion, Michael T. Murray and Joseph E. Pizzorno note in their book "The Encyclopedia of Healing Foods." Capsaicin might also reduce symptoms of gastroesophageal reflux disease and irritable bowel syndrome. 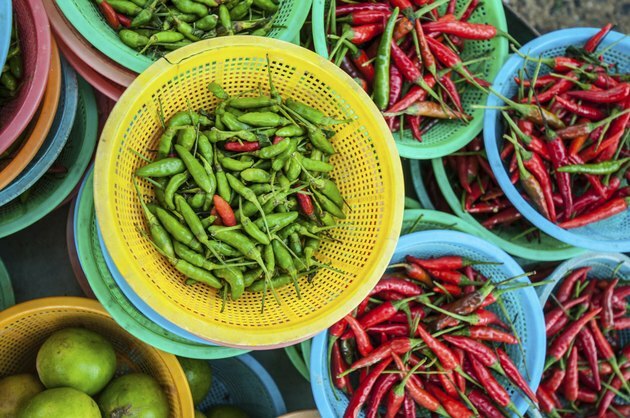 Capsaicin might be useful in weight loss, by activating satiety cues after eating, according to a 2005 article published in the "International Journal of Obesity." Though you don't eat topical capsaicin, it's interesting to note that it's often used as a pain reliever or to help treat skin conditions such as psoriasis. A drawback to eating Tabasco sauce is the amount of sodium it contains. One teaspoon of original Tabasco sauce contains 35 milligrams of sodium, about 2 percent of the daily 1,500-milligram sodium limit recommended by the American Heart Association. A teaspoon of the green jalapeno or garlic pepper flavor contains 150 milligrams of sodium, or 10 percent of your daily limit. The buffalo-style Tabasco sauce flavor contains the most sodium, with 190 milligrams per teaspoon. Watching your sodium is a good way to protect your heart health. Replace your usual sauces with Tabasco sauce to cut your calories and fats. For example, sprinkle Tabasco sauce over tacos or burritos in place of sour cream or over chicken-fried steak in place of gravy. The original flavor is your best bet in terms of sodium content, but no matter what flavor you choose, go easy. The strong flavor of the sauce means you won't need much, and limiting your intake will keep your sodium intake low.